I’m lucky – my family is so supportive of me. They’ve always been really supportive of everything I’ve done, so I shouldn’t be surprised about how supportive they are of my plastic-free challenge. My mom called me a few weeks ago to tell me about the plastic-free, waste-free Christmas rules she set in place for this year! Awesome! 1. You can’t buy any new wrapping, whether it’s wrapping paper, tissue paper, gift bags, ribbons, bows, etc. 2. You can’t buy new cards, including to/from tags. 3. Use only materials you have at home. If you have wrapping paper left from previous years, that’s allowed. You can use newspaper, paper shopping bags, fabric, etc. For tags, use paper, cut-outs of old Christmas cards, etc. Pretty simple, eh? Why not try something like this with your family and friends? Impose a ban against buying new wrapping materials. 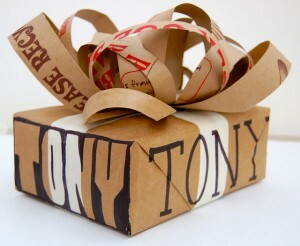 It forces you to be creative with your wrapping and can actually be really fun! If you have rubber stamps (or even crayons, paper cut-outs, etc) you can stamp designs onto the paper bags, cut them and wrap your gifts as usual. The funny pages (colour or black-and-white) are fun as well! Give it a try! What are you doing to eliminate or reduce your plastic and waste this holiday season? Paper bags make good wrapping paper! This entry was posted in Christmas and tagged Christmas, Green Christmas. Bookmark the permalink. 4 Responses to Christmas pledge. Way to go Plastic-Free Girl! You’re not only thinking about what gifts to give others instead of what you’ll get this holiday season, you’re even thinking about the impact of how you give. That’s true holiday spirit–coming up with creative, eco-friendly ideas and sharing them with others. A week ago I signed an online petition where each of us vows to use no plastic bags for the holidays. It’s a small step, but that’s what’s so great about it–it’s easy to start, and once you start then you can make it a New Year’s resolution, and before you know it you’re plastic-free. Thanks George! Hopefully others take this on as well. Now if I could just figure out how to handle italics in html . . .
Cartoons from newspapers are a great idea too!